By most observations, it would be difficult to conclude that America is experiencing a historic shift in the ways we produce and use energy. We are, after all, still mostly using gasoline-only cars, very few homes have solar panels, and in fact most homes – 70% by best estimates – still rely on 100-year-old incandescent bulb technology for lighting. A new report from the Department of Energy lays out many new advances in wind energy, solar PV, LED lighting, and electric vehicles throughout the U.S. The report details major improvements in the economics of clean energy – renewables, electric vehicles and lighting that are accelerating an increasingly rapid shift in certain sectors. 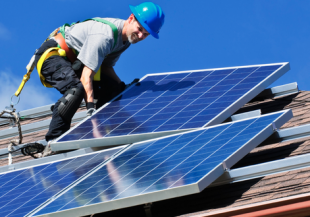 There is now a solar PV system installed in America every four minutes – up from every 80 minutes in 2006 – while the national average price of an installed PV system declined by 26.6 percent in 2012. That drop has been helped by a strong reduction in module costs and pricing due to global oversupply. The DOE points out that the cost of a solar module in 2012 is 1 percent of what it cost 35 years ago. Consequently, two-thirds of all distributed solar PV capacity in the U.S. has been deployed in the last 2 1/2 years. As lighting manufacturers ramp up production, the cost of producing an LED relative to the cost of raw materials has declined by 25 percent each year. This leads some experts to conclude that LEDs may represent 80 percent of all new lighting by 2020. According to the DOE, there were 400,000 LED lights deployed in the U.S. in 2009. With 20 million deployed today, that number has increased by a factor of 50. According to a recent survey from Sylvania, 35 percent of U.S. households now have at least one LED light. After multiple fits and starts, the electric vehicle market in the U.S. is finally starting to make some progress. In the first half of this year, sales of electric vehicles have already been more than double the total of all sales throughout the entirety of 2012. In California, Tesla is outselling high-end cars like Porsches, Lincolns, Land Rovers and Jaguars. And although battery makers have struggled to find customers and appropriate business models, the DOE reports that the cost of manufacturing an EV battery has dropped by 50 percent since 2008.